It’s been a fairly steady diet of cool, cloudy and at times showery weather so far this week. We’ll keep cool and cloudy to close the work week, but after that? 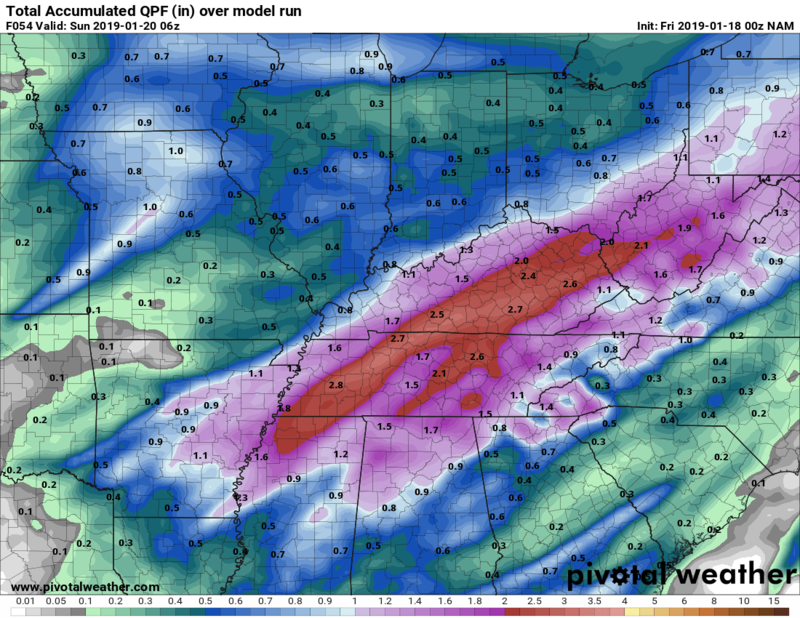 You’re going to want to buckle up for a weekend of wild weather. The showers of yesterday will be long gone and we’ll spend the day today in between weather systems…and this means a return to cool and cloudy (but dry!) conditions. I still think we’re going to see a little bit in the way of sunshine today, not a lot, but some. Either way, it’s not going to help our temperatures any. Highs top out around average, which is to say close to 45º. It’s late Friday night that things start to change. Clouds will increase overnight Friday and this ensures temperatures will hold steady in the mid 40s and even rise early in the morning. Heavy rain will begin to move in just before daybreak as will brisk southwest breezes. Please keep your hands and feet inside of Saturday at all times. Temperatures are going to soar as the rain moves in and this will be heavy rain. We’re talking upwards of two to three inches possible before all is said and done tomorrow. With this being such a dynamic system, we can’t rule out some thunder or a strong wind gust or two with any of the rain we see over the next 48 hours. Highs will top out around 58º…during the afternoon. That’s when things get interesting. Temperatures will fall from near 60º in the afternoon into the upper 20s by the late evening hours. This means two things. 1. Any moisture left over will mean a transition from rain to snow. Models have been a bit bullish in the past 12 hours or so with totals. I’m not sold on any kind of accumulation at this point. What I’m more concerned about is 2. A flash freeze. Northwest winds will be breezy late Saturday night and early Sunday, but they probably won’t be enough to dry all of the moisture left on the roads, which will freeze as temperatures tumble. This could create slick spots on area roadways, especially those that aren’t treated as well as elevated surface such as bridges and overpasses. Either way, things should dry out come Sunday, but we’ll stay frigid. Clouds should begin to clear and we have a pretty good chance at sunshine Sunday afternoon as we begin to slowly dry out. What won’t be improving, however, is temperatures, which will remain in the low 30s…for highs. The clear skies continue into the nighttime hours, where lows will fall to near 15º overnight, for our coldest temps of the winter so far. This is all thanks to calming winds and clear skies, which will allow whatever “heat” we have to escape to space. Leave those faucets running to make sure the pipes don’t freeze and burst. And folks, that’s just the weekend. We look to dry out for MLK Day before the active pattern continues into midweek next week. The fun times are back.